Baby Bean Buzz: One More Week! Oh my goodness...one week left! God is so faithful. During those early weeks of this pregnancy, I was really struggling to see the proverbial light at the end of what looked like a very, very dark tunnel. But, as I near the end now, I can tell you that as I look back, I don't see darkness. I simply see God's grace carrying me through, and continually giving me SO much joy! I am currently scheduled to have a c-section on Thursday morning. However, I will have an amniocentesis on Monday to be sure that the baby's lungs are fully developed. If not, then we will push the date back a bit (probably a week), and I'll deliver then. Jason's parents are coming to take care of Jack and Max while I'm in the hospital! They will be in GREAT (and loving) hands with Grandma and Grandpa! Of course, now they're best buddies! But, I'm praying for their hearts now! I'm not really worried about Jack this time; he seems very excited to meet the new baby. 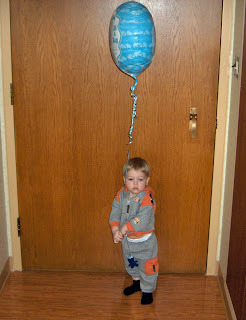 But Max isn't yet two, and is very tender-hearted and I wonder how he'll respond. We'll be digging out baby gear this weekend, filling baskets with diapers, and I'll be getting some much needed rest (thanks to my incredibly selfless hubby!) And, we're having a special date night with Dave and Jenni on Saturday night as one last hurrah. My sister calls it "The Last Supper!" We can't wait! it's hard to believe that 9 months has passed. you must be so ready to meet baby bean. you, as well as your boys (all 3), will be in my prayers. it's such an exciting time. Is it bad to hope that the date gets pushed back so that I have internet when the big day happens!?! I will continue to pray for God's hand to guide you and the doctors! Love the photos! Max will be fine. The fact that Jack is excited will help. Laughing about the "last supper" comment. :) Before my sister had her first baby, I shared that it may be a good idea to have a "last movie theater night". The Lord will be with you. He will be behind you holding you up with His strength, and He will go before you as your little one enters this world. Those are priceless pictures. I'm sure Max will be fine though, and if not- well it won't take long to get over it. 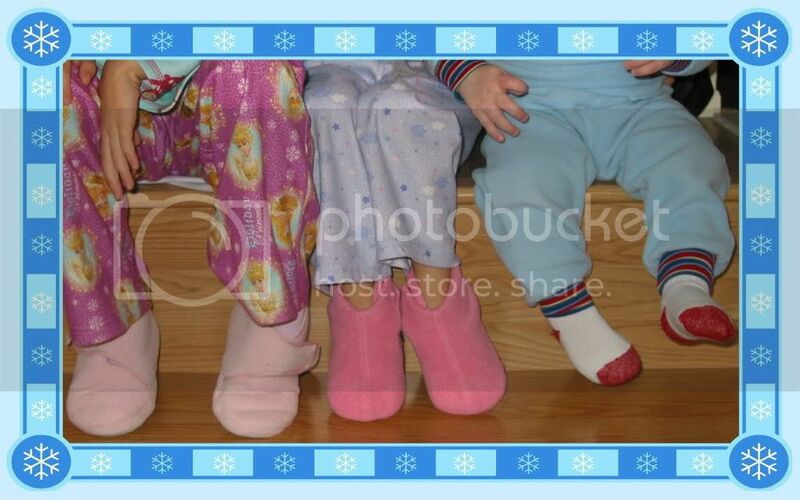 Blessings to you as you spend this last week as a family of 4. Is this your first C-section? Both of mine were c's. Praying for you all...I'm glad Jay is taking such care of you :) He's a wonderful guy! Love you! Oh, one more thing!! We're joining in on "the Last Supper" thing w/ the Lankfords this weekend :) Their little guy will be coming next Friday!! I'll have to send you a pic when I get one--he's adorable (he was born on the 9th). I am sure your boys will be so excited to see the new baby! Max will sense Jack's excitement and copy his behavior. I am positive it will be a different experience then last time. Take care this week and enjoy the last moments of being pregnant. It is a special time. Sometimes VERY hard, but miraculous. Have a fun night out this weekend. 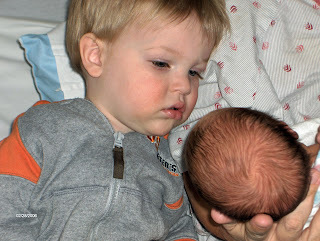 Max will do fine with the baby - he will have his best buddy Jack to play with and show him the ropes. There is always a time of adjustment for all but it will be wonderful to welcome this new little bean. How fun to have grandpa and grandma here to love on them while you are in the hospital - that is a treat! 2) Those pictures bring me back - you took them the day I came to visit you all in the hospital and that was the first time I met Jack. I can't believe he was ever that little! 3) Don't worry so much about Max. My Anna is totally Mommy's little girl and didn't miss a beat when Lily came. 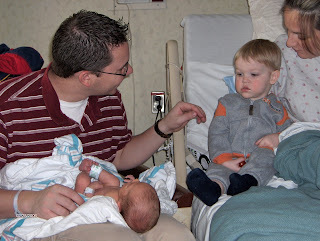 It was hard being at the hospital without them, but looking back, those 3 days went so quickly. Anyway, I'm sure Jack and Max will just play on while you and baby get adjusted. We will be praying for the transition for you! one more week, hopefully...we'll be praying on Monday that all looks good for Thursday...at least Max has Jack to be with and lots of people will be there in the beginning to give him attention and get him into the whole thing; I'm sure he'll be so cute. Honestly, my favorite moments in my heart are the moments that the siblings meeet. I cried like a baby when K met T (we were at home) K was so attached to mommy that we felt the hospital would be too much. Course, when they all met D, they loved it. K was all over him. T was excited for a few mins and then played with my cell phone - clearly more interesting! I didn't realize you were having a C section. Tough recovery...I"ll be praying for you. OH, Sar... this is such a beautiful blog. Thanks for sharing your mommy thoughts. This little one will be a great addition to your family, even if it takes the little guys a little time adjusting to another "mommy and daddy diversion". God bless. Wow, that time sure went fast..at least for me anyway! I can't wait to hear what you have. How wonderful. I'll be praying for you! EEKKK! Can't wait to hear how everything goes! Such sweet pics of Jack and new baby Max. He will love the little one just as much as he loves Max now. Enjoy these last days! I love those pictures - what a look on his face. Can't wait to see pictures of baby bean and the older brothers! This is such a sweet post. Love the pics. This makes it even more exciting as we wait for baby bean's arrival. Praise God for these huge miracles in tiny packages. Is this your first C-Section?